The SPs have rallied over 140 points in 5 days. The tick chart that we have been posting for the past few days shows how price hit the upper level of a broader trading range. The updated chart below shows how price is now backing down off the momentum divergence and can ultimately trade back down to the high volume node (yellow line). First stop though is the “pocket area” -1929 – 30. The yellow line shows the high volume node at 1926. The broader volume lines (gray lines) at the bottom of the chart emphasize the base that formed that supported this upside breakout. This volume profile chart that I have been posting is a ten day look back period so their are subtle changes from day to day but it is helpful still, in pointing out relevant levels. The short term closing TICK indicator posted just below is a 5 day simple moving average of the closing ticks. 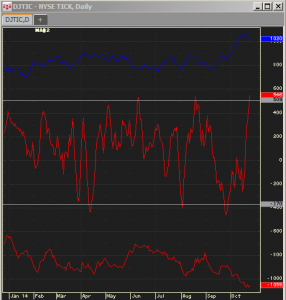 You can see that it has hit overbought readings. It does not hit overbought or oversold that often but is usually significant when it does. 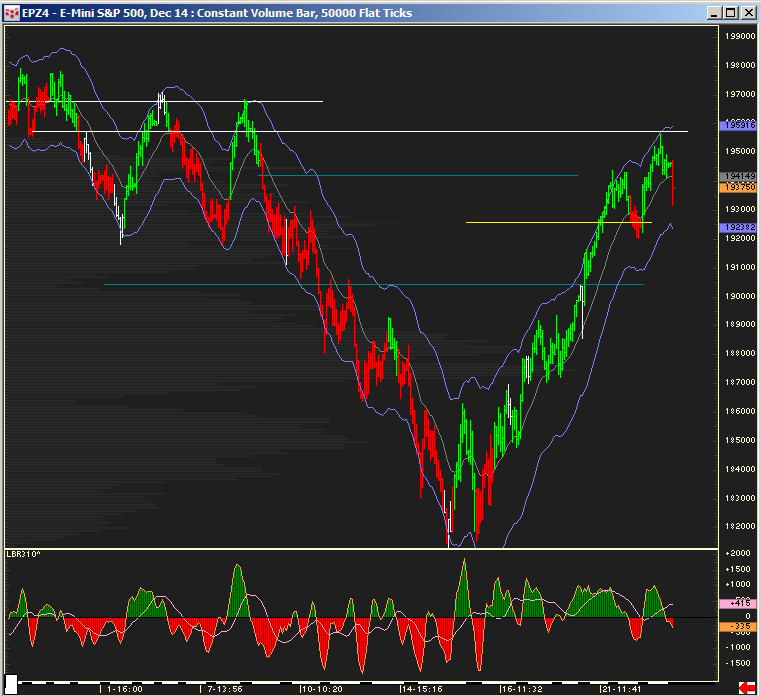 This chart is based off CQG which has slightly different tick readings that TradeStation. “Ticks” is not an exchange broadcasted symbol but one that each data vendor calculates internally. 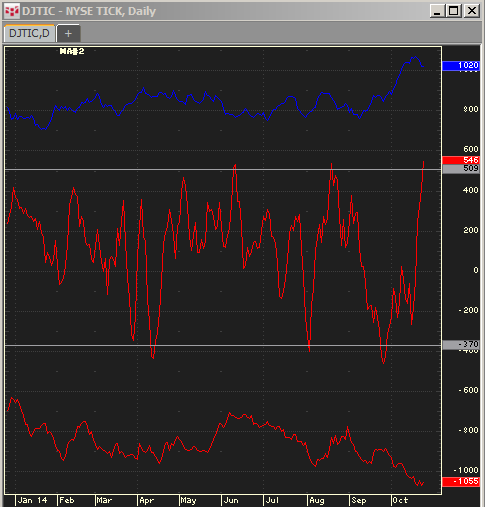 So, even though the readings on CQG might vary from the readings on TradeStation or another program, they are all relative unto themselves and give the same timely signals. For Friday: the Sps will either fill in the range from the “pocket” area to Thursdays close, or, if they trade back down below the 31 handle, 26 can come into play. Bonds hit the daily EMA and technically have a grail buy. A full retest up may be unlikely due to the severe price rejection spike, but 142’11 would be a close back above the 5 SMA. EC – try up after 4 days of lower lows, but this is the weakest currency. Better to say the Dollar index is poised for a reaction down and AD and CD might have the better upside play. The dollar index is still consolidating the recent large standard deviation move made on the weekly charts and overall downside is limited as the weekly charts have a nice bull flag. Wheat is on an extended run to the upside. 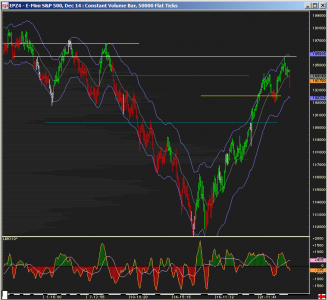 Weekly EMA is in play for Wheat and Beans. Dec Cows at contract highs. 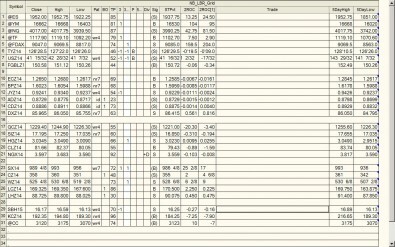 Mick is gone on Friday and posted the trade sheet just before he left on Thursday so the closing prices are off slightly. 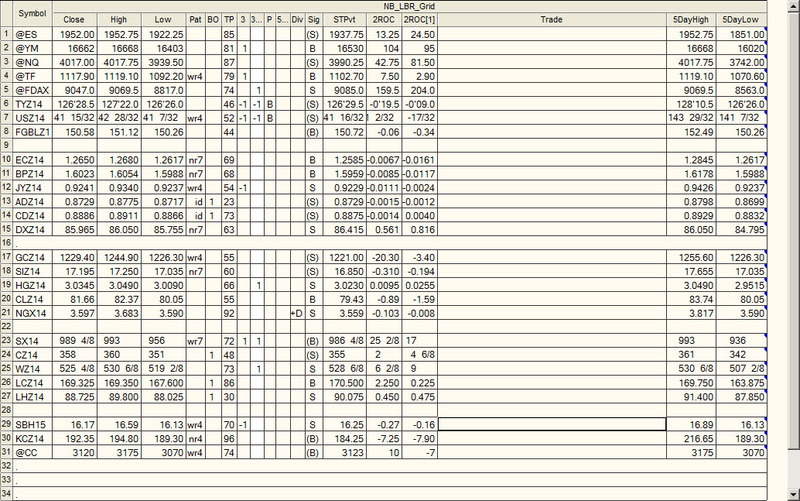 Most notable signal is the pinball Buy on the bonds and tens. Have a great day and a fabulous weekend! I will be back in Chicago next week!